[prMac.com] Seoul, South Korea - BOTO the Pink Dolphin 2 is the latest release in learning games for kids, developed by the Child Creativity Institute. Available for iOS and Android, the app features an innovative six stage learning system at the core of a fun and interactive storyline filled with underwater escapades that keep kids engaged. The game itself follows a storyline very comparable to an e-book format centered on the lovable dolphin BOTO. Each stage requires children to follow a specific set of instructions and travel the ocean to complete tasks ranging from puzzles to creative drawing. Children will be so wrapped up in the storyline that they won't even realize that they are learning. A performance assessment is available to parents following the completion of each stage. The child's grade can be accessed to determine areas of proficiency and excellence. The information can be used as a tool to help identify particularly effective learning styles and explore avenues or methods for better education. Each stage provides instructions for learning as well as guidance. Players will encounter challenges for recognition, puzzles, intuition, attention, logical thinking and creative drawing. At the end of each stage parents will have access to their child's grade to monitor their performance, development and also to identify the most effective teaching methods. "Players will face the most comprehensive and complete spectrum of challenges including: puzzles, intuition, attention, recognition, logical thinking and imagination through creative drawing," said Creative Bomb CEO Myung Yub Ma. "Creativity comes in many forms and it should be nurtured, especially during early ages. The app provides kids with the tools to explore those creative avenues. Colorful and exciting characters offer young gamers the chance to have fun, without feeling like they are actually taking a creative assessment. This method removes the pressure that is inherent to "testing" and also teaches children that learning can be fun. At the end of the story, children are essentially awarded as they are asked to draw different pictures. This final lesson affords them the opportunity to display originality, flexibility and creativity after taking the exciting underwater journey with BOTO. The app also offers captions and voice-acted narration in English, Japanese and Korean. This additional feature affords children the opportunity to gain early exposure and access to foreign languages. 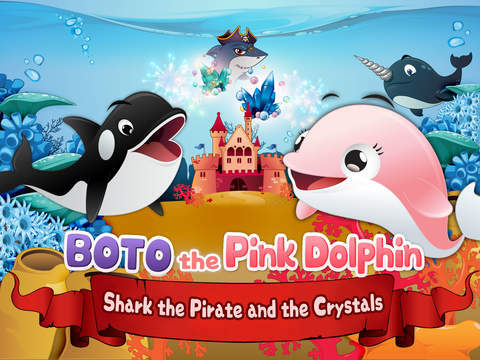 BOTO the Pink Dolphin 2 v.1.0.1 is only $0.99 USD (or equivalent amount in other currencies) and available worldwide through the App Store in the Education category. There is also an Android version available on Google Play for Free. Creative Bomb is a South Korean based mobile app development company. We are focused in developing interactive edutainment apps for kids that works on iOS and Android platforms. All Material and Software (C) Copyright 2014 Creative Bomb. All Rights Reserved. Apple, the Apple logo, iPhone, iPod and iPad are registered trademarks of Apple Inc. in the U.S. and/or other countries. Other trademarks and registered trademarks may be the property of their respective owners.